The ancient chakra system which is followed in many healing modalities, like accupuncture, accupressure, pranic healing and many other alternate healing therapies all the major energy centers (chakras) lie on the spine. Also according to the ancient teachings our spine is highly significant in our spiritual advancement. The Kundalini (Chi/ secret energy ) lies as potential energy at the base of the spine and the great saints/advance meditators are able to raise this energy through the chakras to explore/experience awakening. Ok not to overwhelm 🙂 let us understand the day to day significance. Our spine is an amazing masterpiece creation by god but unfortunately due to our emotional imbalance and offcourse to add on the lifestyle , increasing stress and poor posture there are increasing number of back pain cases seen across the world. Back pain issues in >25 yrs age group is as common ailment as cough and cold and people are living with it till they are diagnosed with spondylitis, sciatica pain, slip disc,numbness in lower limbs or chances of paralysis. Your spine is composed of 33 vertebrae stacked like building blocks inter layered with shock absorbing discs, no fewer than 641 back muscles and millions of nerve fibres allow you to stand up straight and allow you to twist and bend and remain still. It is a miracle we take for granted. To simplify this I’m going to refer to these areas as lower, middle and upper back. What you are about to read is not to replace our medical treatment. It is to open up your mindset to the possible emotional connection that may be causing or amplifying your back pain. Our spine is our support system and represents the life support and problems with the back usually mean we feel we are not being supported. Now let us understand the emotions that affect the upper , middle and lower back issues. The Upper Back (C1 -C7 cervical issues) has to do with feeling the lack of emotional support; feeling significant people in your life don’t understand you or support you. You may feel unloved or you may be holding back your love from someone. Upper back pain could also mean that you feel that somebody is always on your back. By changing a belief that you are responsible for other people’s happiness, it can relieve pain in your upper back and neck. Do things for others from your heart, not from a place of feeling you have to do it or they won’t love you.Gaining love of yourself will not only increase your happiness – you will be supported from the inside first. Middle Back Pain ( Thoracic T1 -T !2) emotionally speaking, pain in the middle back comes from feeling guilty about ‘stuff’ from the past. Perhaps you are afraid to explore your past? Maybe you are hiding what is back there? Do you feel stabbed in the back? Do you find yourself wanting to scream out, “Get off my back!”? In order to move freely into your future, you need to release the past anger and guilt and embrace your present and future with love in your heart. Lower Back Pain (Lumbar sacral and coccyx) with today’s financial hard times, are your finances in a mess? Do you worry about them excessively? The lack of money, fear of not having enough, or fear of material loss may be the cause of your lower back bothering you. The amount of money you have has nothing to do with it. It’s the fear of lack of financial support, the fear of your own survival that amplifies the pain. Eliminating paralyzing guilt, clearing your past from anger and transforming your fear into personal power will help you gain control, well-being and find peace of mind you may long for in your life. Pranic Healing, EFT, Neuro Linguistic Programming and other alternate therapies are highly effective. A back pain is just a symptom so treating it at a physical level is only a short term solution understand and working on the cause will help you lead a better life. The Following diagram shows the 33 vertebra and their corresponding muscle functions and nerve path. For you to decode your spinal X Rays and MRIs. 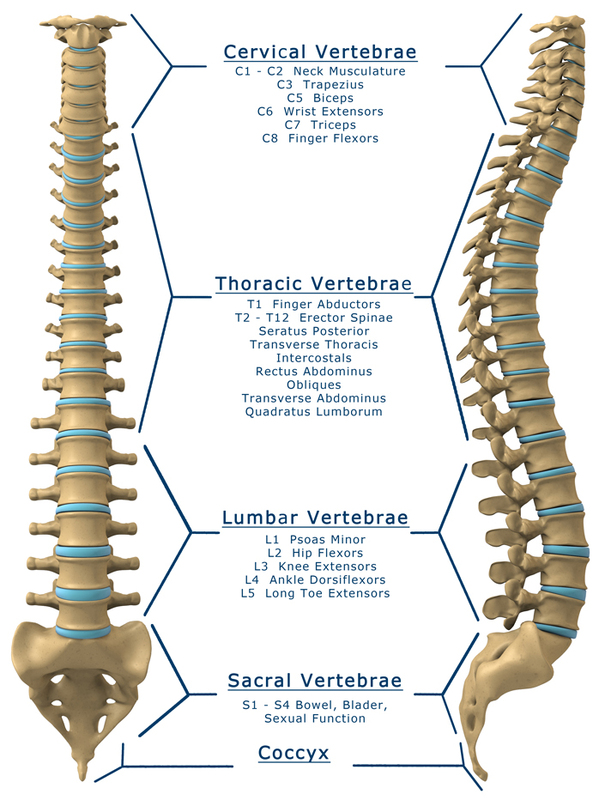 The correspondence diagram for every vertebra Note it is important to always have any back pain checked by a medical doctor or a chiropractor.